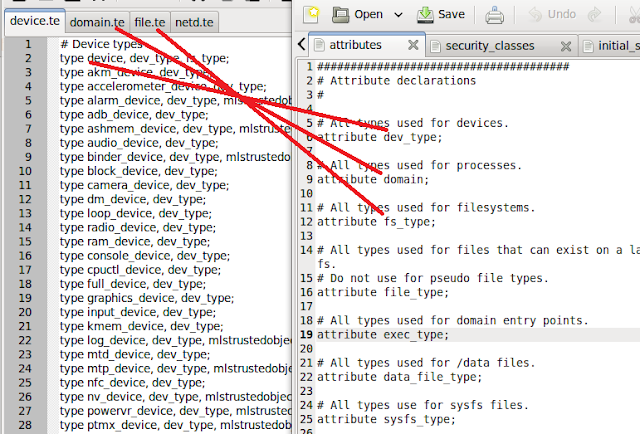 The MAC policy configuration files are contained in the external/sepolicy directory, however there may also be policy configuration files to enable specific device features under device/<vendor> directories (see the Building the Policy section). 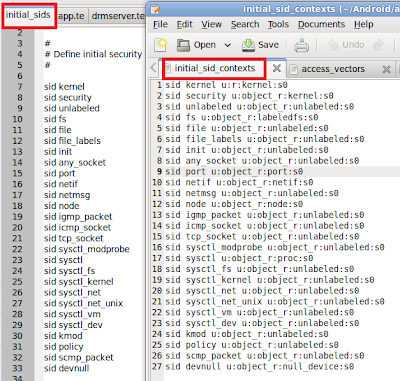 Once generated, the policy and its supporting configuration files are installed on the device as part of the build process. Above table is generated by "kernel/goldfish/scripts/selinux/genheaders.c" according to "kernel/goldfish/security/selinux/include/classmap.h". 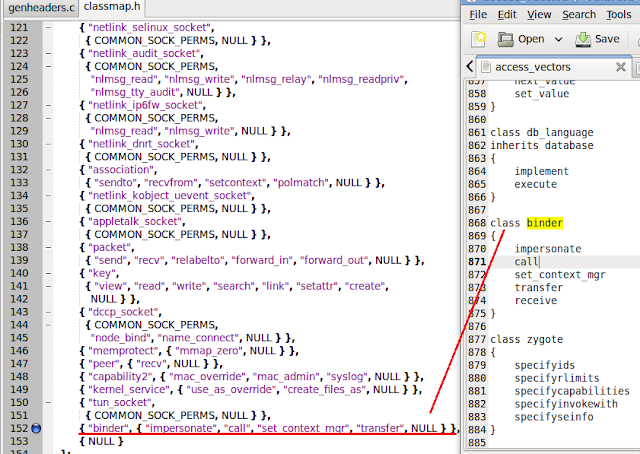 Below figure shows the contents of classmap.h. 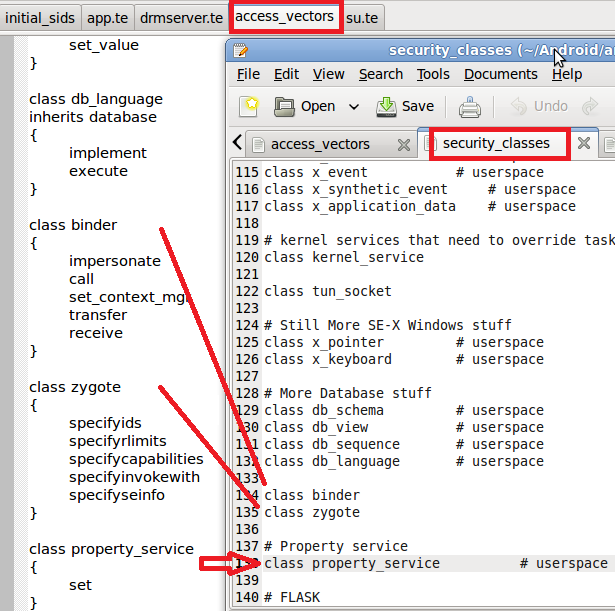 access_vectors is used in external/libsepol/include/sepol/policydb/flask_types.h. 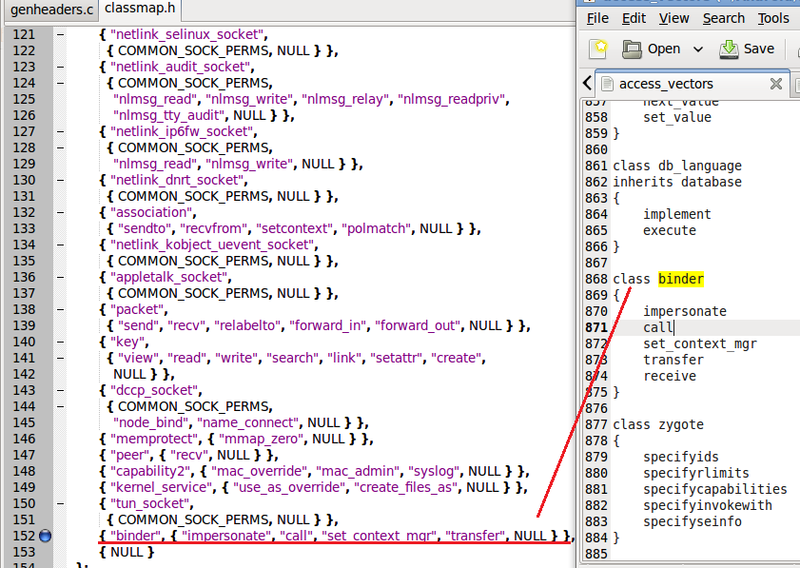 It deﬁnes the access vector permissions for each class. # Define the access vectors. 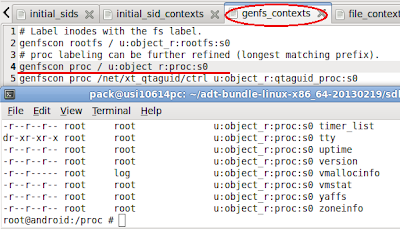 # Define the access vector interpretation for file-related objects. 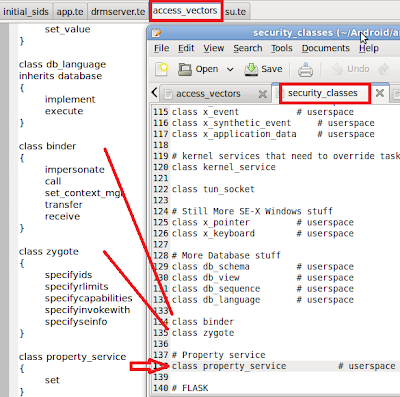 security_classes is used in external/libsepol/include/sepol/policydb/flask_types.h. It declares the security classes. For flexibility of policy building, these files have been separated to allow additional policy files to be defined for specific devices. 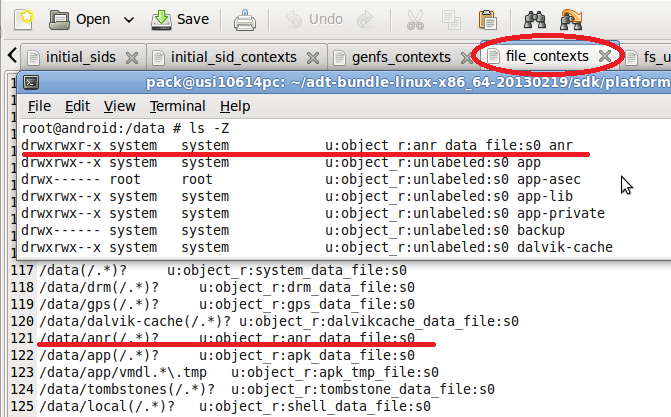 fs_use is used in external/libsepol/include/sepol/policydb/service.h & kernel/goldfish/security/selinux/ss/services.c, ... files. 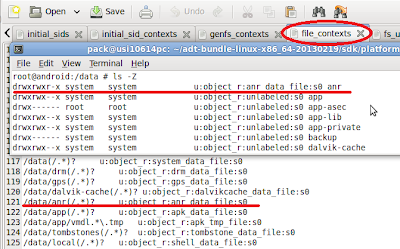 These contain the m4 macros that expand the policy files to build a policy in the kernel policy language as described in the Policy Language section. The policy can then be compiled by checkpolicy(8). 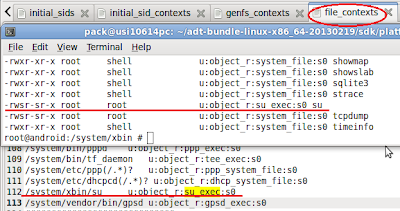 For reference, the policy text file is built and placed in: out/target/product/<device>/obj/ETC/sepolicy_intermediates/policy.conf The compiled kernel policy can also be found in this directory and is named sepolicy. There are also policy.conf.dontaudit andsepolicy.dontaudit files that have the dontaudit rules removed. 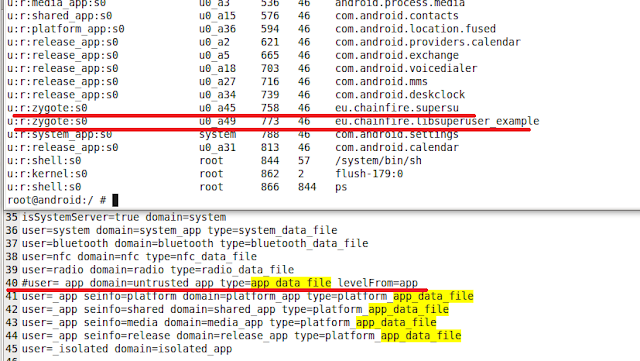 Stripping out these rules stops the auditing of denial messages as they are known events and do not cause any issues. 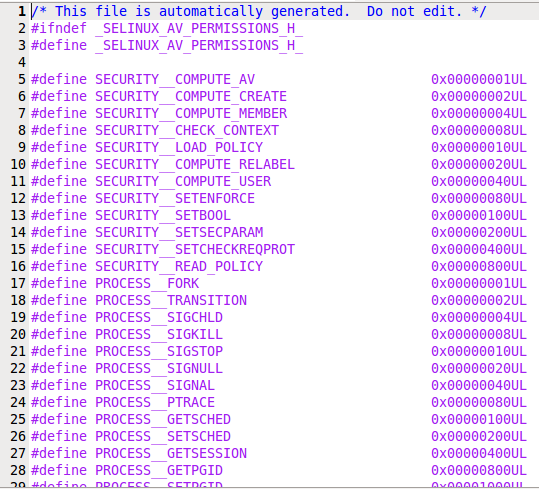 This also helps to manage the audit log by excluding known denial events. 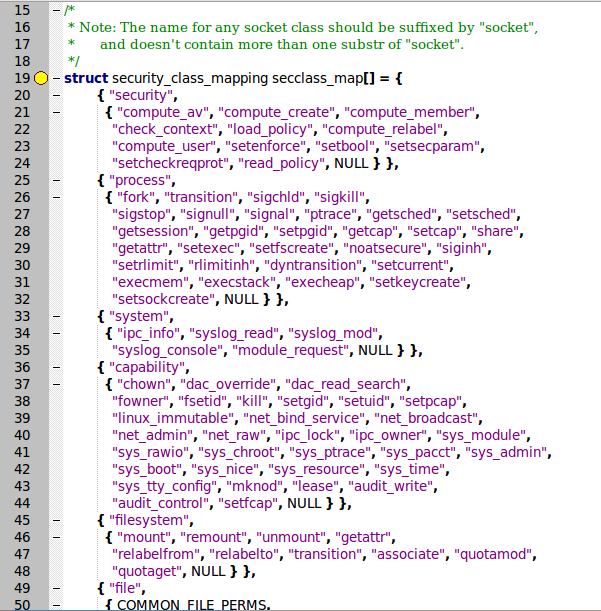 Contains the attribute names (forming the attribute statements) that will be used to group type identifiers defined by the policy. Types are the basic building blocks for TE rules. SELinux primarily uses types to determine what access is allowed. 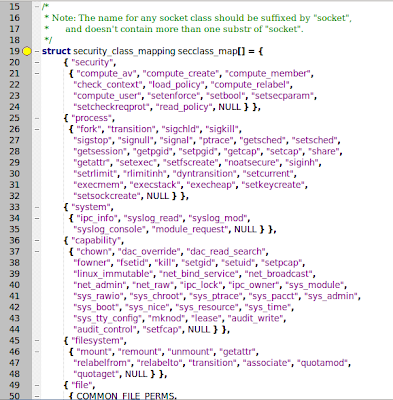 Attributes and aliases are policy features that ease the management and use of types. 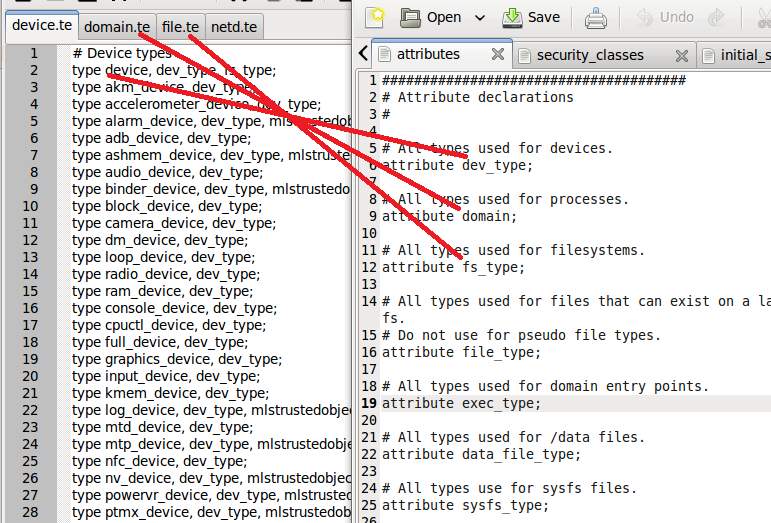 We use attributes to refer to a group of types with a single identifier. #All types used for devices. 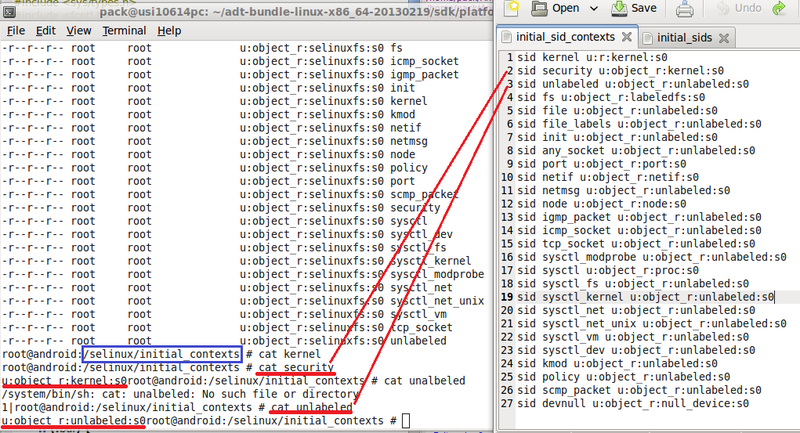 Contains the policy capabilities enabled for the kernel policy (see policycap statement). 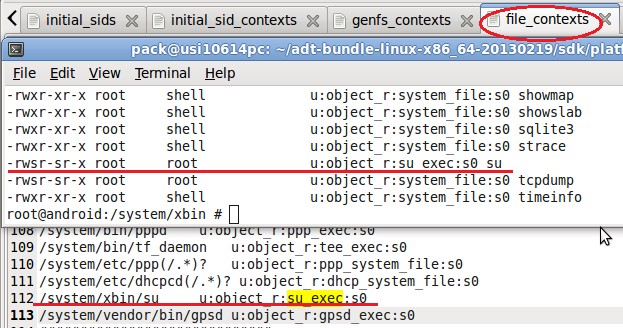 It is used in external/libsepol/src/polcaps.c and kernel/goldfish/security/selinux/selinuxfs.c. capability The capability identifier that needs to be enabled for this policy. # for use by the policy. 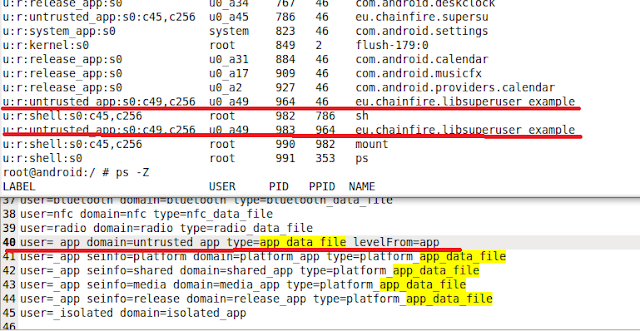 Below figures show the file_contexts you will see in the console. 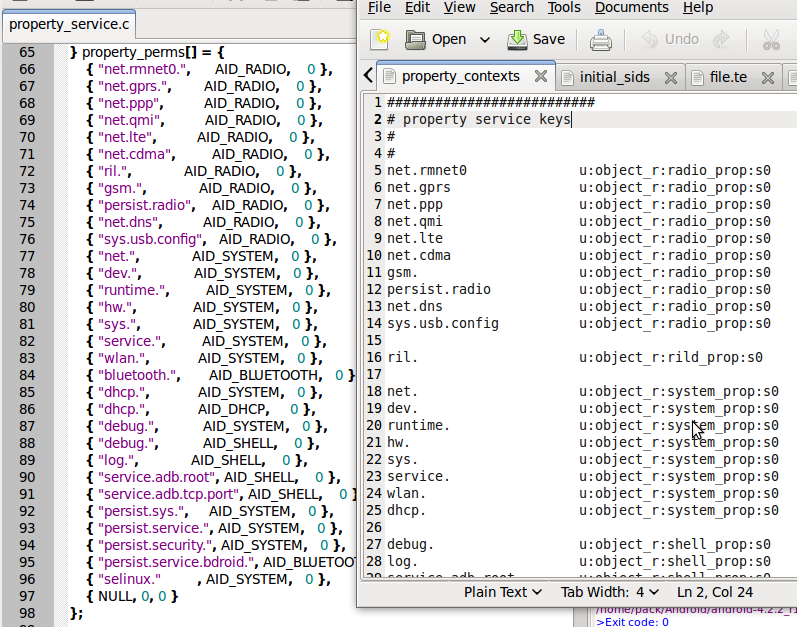 This file is used in system/core/init/initc. Above picture shows "untrusted_app" domain defined in seapp_contexts and the process contexts shown in system. 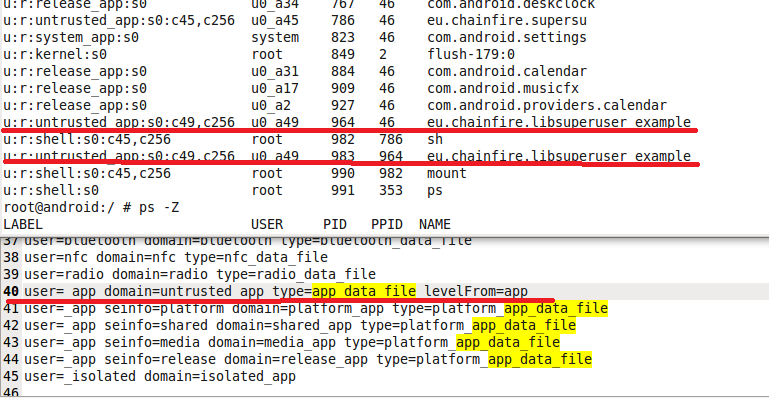 If the "untrusted_app" domain is not defined in seapp_coontexts, the process context will become "zygote", a default label. The picture is shown as below.